We inform and educate Christian community and churches regarding people affected by different disabilities, and their specific needs. 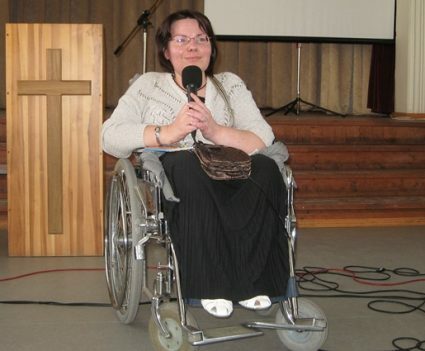 Although the attitude toward disabled people has improved in Latvia lately, there still are many barriers that prevent disabled people from inclusion in society, including churches. The main reason is a lack of knowledge and awareness. We visit churches interested in raising their awareness, and tell them of Wings for Wheels ministry and how God sees people affected by a disability. We are open to long term cooperation to educate and give practical advises. A helpful resource for every church can become “Manual for Christian Churches: How to Help People with Disabilities” compelled and published by our ministry.